Every day, huge quantities of dangerous Goods and hazardous chemicals are transported throughout the UK by road. Do the smaller vans and trailers carrying such packages need to display hazardous goods labels? Normally, when vehicles are transporting packages of dangerous goods, they must show the ADR orange plates (front and rear) and any freight container must also be labelled with the appropriate class placards on all four sides. When the dangerous goods are removed from the vehicle, the ADR plates must also be removed, or obscured, along with the warning placards (magnetic or otherwise) to show that hazardous cargo is no longer on-board. Vehicles used to transport small quantities of packaged dangerous goods, such as vans and trailers, are exempt from these requirements if they are carrying under the load thresholds set out in the ADR regulations. The minimum quantities that can be carried without signage will depend on the nature and classification of the goods: the higher the risk, the lower the amounts that can be carried. The UK Health & Safty Executive (HSE) website lists the main exemptions under ADR. In practice, though most of the operators carrying small loads of dangerous goods ensure that their vehicles do not display the orange plates, they will often show the 100mm hazardous goods labels (warning diamonds). Is this an offence? Many operators consider it to be good practice to display the 100mm warning diamond labels on small vehicles, especially those carrying compressed gas cylinders, to indicate the hazards connected to the goods being carried. Warning diamond labels can regularly be seen on ambulances, engineer’s vans, mobile workshops, and road construction vehicles. It is thought to be useful to the emergency services, even though it is not a requirement under ADR. Although it is the HSE (Health & Safety Executive), which is mainly responsible for enforcing the numerous regulations devised to ensure safety while these substances are in transit, it is the emergency services who have to deal with the consequences of any incident. Emergency responders will take account of such external warnings as ADR plates and warning placards in their risk assessment and some members of the emergency services are concerned that inappropriate action may be taken in the event of an accident involving improperly marked vehicles. Vehicles not displaying orange ADR plates would usually be treated as low risk because the goods should be in limited quantities or under the ‘small load’ limits. If this is NOT the case, then an offence has been committed. Managing the volumes of dangerous goods being carried is essential to avoid an excessive legislative burden – if thresholds are triggered, more than simple signage may be required: ADR plates and warning diamond placards would have to be displayed, the vehicle would have to be specifically designed for carrying such substances and the drivers would have to be adequately trained and briefed as to their duties when carrying the goods. The 100mm warning diamond labels are intended to be packaging labels, and though no objection is usually taken to their display, they have no relevance in this context and should not be used on any type of vehicle. 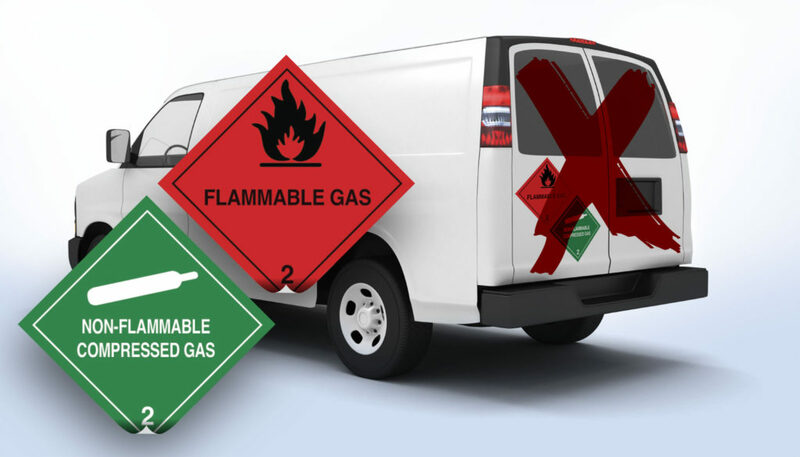 Sometimes, totally confusing signage: compressed gas, highly flammable and corrosive can all be seen on the same rear doors of vans, placed there in an attempt to ‘do what is right’, but without the detailed knowledge of what is required under CDG regulations – and this is assuming that the substances are actually on board! In summary, unless the minimum quantity threshold is triggered for the respective hazardous substances being carried, no labelling or signage is required on the vehicle. Most fire crews now have immediate access to Chemdata and would only need to know the UN Number of the substance and what quantity is carried in what receptacles. It would be far better to provide a hard copy of the relevant SDS’s, and advise the driver what to tell the emergency services, than unnecessarily sticking hazardous goods labels onto vehicles.